A red maple infested by Asian longhorned beetles in Carteret, New Jersey. Heavy feeding by the larvae inside the tree caused the bark to slough off, exposing the extensive boring or tunneling they did. Starry sky beetle. The nickname hardly does the Asian longhorned beetle (ALB) justice. After all, there’s nothing celestial or awe-inspiring about an insect that’s managed to strike fear in tree-loving communities across the country. In the East, urban tree managers have been on high alert since 1996 when the bullet-shaped beetle was first spotted chewing tunnels through cherished hardwoods. And in California, where it suddenly appeared last July, agriculture officials have been posting “wanted” signs, inviting the public to help hunt down the wood-hungry exotic. Why all the hype? With impressive instincts and powerful jaws, the female beetle will chomp through several layers of fibrous tree tissue to deposit her eggs safely inside a tree’s trunk. Her excavation—and her progeny’s development—damage the tree’s vital plumbing, the inner channels needed for shuttling water to lofty branches. When limbs start dying off, the afflicted tree loses structural stability, requiring workers to chop it down out of concern for pedestrian safety. The once-vibrant tree is then ground into tiny bits to ensure that no beetles remain. Looking to disrupt this scary trend, ARS insect behaviorist Michael T. Smith is developing ways of spotting the beetle early on. The sooner tree managers know about an invasion, the sooner they can quarantine an affected area and stop the ALB’s spread. 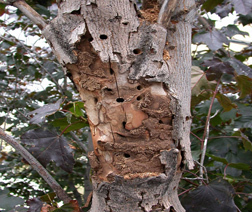 Typical leaf-feeding damage caused by the adult Asian longhorned beetle. This leaf is from an Acer mono sentinel tree. By studying the insect’s habits, likes, and dislikes, Smith hopes to uncover specific quirks that can be used against it. For instance, he recently discovered that adult, free-flying ALBs are practically infatuated with the Shantung maple (Acer mono), a species native to eastern China. “We’ve found that this tree is even more attractive to the beetle than the Norway maple, the species the insect is most drawn to in the United States,” Smith says. Through their super-sensitive antennae, beetles can sniff out the subtle aromas trees give off. 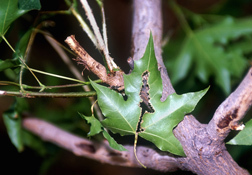 Thanks to Smith’s finding, tree managers can use potted Shantung maples as a magnet to draw out the insect and confirm its presence in a given area. Even if beetles aren’t actually caught, he says, their feeding leaves behind telltale arboreal markings that give them away. Smith’s latest discovery is that a highly effective insecticide also doubles as a detector. Detection remains one of the most challenging aspects of ALB eradication, since the beetle spends most of its life cycle hidden deep inside trees. Surveyors must climb trees one by one, visually scanning them for the tiniest signs of beetle activity. 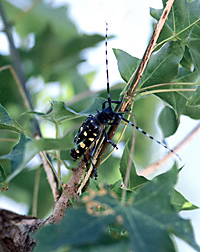 Adult Asian longhorned beetle feeding on a twig of a potted Acer mono sentinel tree. After conducting a year and a half of laboratory and field studies, Smith says the chemical, lambda-cyhalothrin—a pyrethroid known commercially as “Demand CS”—is almost 100 percent effective against ALB. “This insecticide knocks down the beetles just minutes after application,” says Smith. It’s the chemical’s swift paralyzing effect that enables it to serve as an excellent detector and monitoring agent. And if beetles land on trees treated within the previous 90 days, Smith says, they would still be killed. In this way, the insecticide can be used to shield vulnerable tree species from attack. Smith says the chemical’s dosage and release rate can be altered to fit a variety of scenarios. Another positive: The pesticide, already registered for use against a host of pesky insects, should be available for tree managers to use as the beetles start emerging from trees this spring. Helping Smith find new ways to track the beetles before they can do more damage is ARS entomologist Wayne Hunter. Hunter, who specializes in insect genomics, works in the agency’s Subtropical Insects Research Unit, at Fort Pierce, Florida. Like forensic scientists, Hunter and Smith are plotting ways to use the beetle’s DNA, left at the crime scene, as a way of knowing if they’re actively feeding on trees. ALB droppings, called frass, have a genetic signature that’s unique to the insect. So Hunter is developing genetic markers that can be used to screen frass samples found on trees to find out if the beetles are present. Hunter is also studying the beetle’s capacity to sidestep human efforts to control it. He’s found that when it’s exposed to the pesticide Smith’s investigating, the insect produces a notable genetic response. This reaction shows that the insect’s system is trying to adapt—that the beetle is struggling to survive. “Understanding how the beetle tries to detoxify the insecticide should help us get around the problem of insecticide resistance,” he says. One way the beetle could eventually compensate for the insecticide is by making excess wax to help shield its body from the toxin. If this were to happen, scientists could either develop a new insecticide or modify the existing one. Hunter thinks it’s best to work with a combination of the current insecticide and an ALB-specific virus he’s recently discovered. This virus would make the insect more susceptible to pesticides, and it could provide a means to down-regulate important, protective proteins. Hunter and Smith say that much more genetic information is needed about ALB and about how trees respond to beetle infestation. This is important, Hunter says, because a genetic approach is one of the best ways to get critical details quickly. And time is what both Smith and Hunter would certainly like more of, before the beetle invades yet another hardwood forest or tree-lined community.—By Erin K. Peabody and Alfredo Flores, Agricultural Research Service Information Staff. To reach scientists mentioned in this story, contact Erin Peabody, USDA-ARS Information Staff, 5601 Sunnyside Ave., Beltsville, MD 20705-5129; phone (301) 504-1624, fax (301) 504-1486. "New Defenses Against the Daunting Asian Longhorned Beetle" was published in the May 2006 issue of Agricultural Research magazine.